Injuries to Malcolm Brogdon and Nikola Mirotic are weighing them down, but the first-place Milwaukee Bucks have picked up the pace. The Bucks rank second in the NBA in pace (possessions per 48 minutes) this month at 104.27, up from sixth overall (103.26) on the season. At the other end of the spectrum, the Miami Heat, who visit Fiserv Forum on Friday, have slowed things down. Currently the No. 8 seed in the Eastern Conference and a likely playoff opponent for Milwaukee, Miami ranks 29th in the league in pace this month at 96.8, and 26th on the season at 98.62. That dynamic has worked out pretty well for the Bucks in their last two meetings with the Heat. The Bucks knocked off Miami 113-98 last Friday despite trailing by 20 points at halftime, and won their previous meeting 124-86. Miami won their first meeting 94-87, but this year’s season series has been among the most lopsided in the two teams’ history. 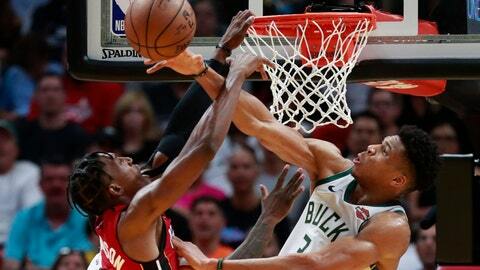 The Bucks have an average scoring margin of plus-15.3 against the Heat this season, their highest ever against Miami. — The Bucks and Heat rank first and second respectively at defense inside the arc. The Bucks’ opponent two-point shooting percentage is the lowest in the league at 47.9, while the Heat rank second at just 49.4 percent. — At the same time, Bucks big man Brook Lopez has been a key contributor outside the arc. Lopez has made 170 3s this season, and needs just three more to set the single-season record for a 7-footer. — Bucks forward Khris Middleton went 4-for-6 from 3-point range Wednesday in the Bucks’ loss to Cleveland. He now has 46 games with at least four made 3s in a Bucks uniform, third in franchise history. — Heat guard Goran Dragic has also been thriving from deep recently. Dragic is shooting 49 percent from 3-point range since Feb. 1, third in the league over that span amongst players with at least 50 3-point attempts. — Heat center Bam Adebayo is the second-youngest player this season to post 15-plus rebounds and five-plus assists in the same game this season, behind Dallas Mavericks rookie Luka Doncic, after doing so Wednesday in a win over San Antonio.